Utagawa Kunisada/Toyokuni III (1786-1865) Secret Meetings by Moonlight (Tsuki no kage shinobiau yoru), 1836 -1838. Oban. 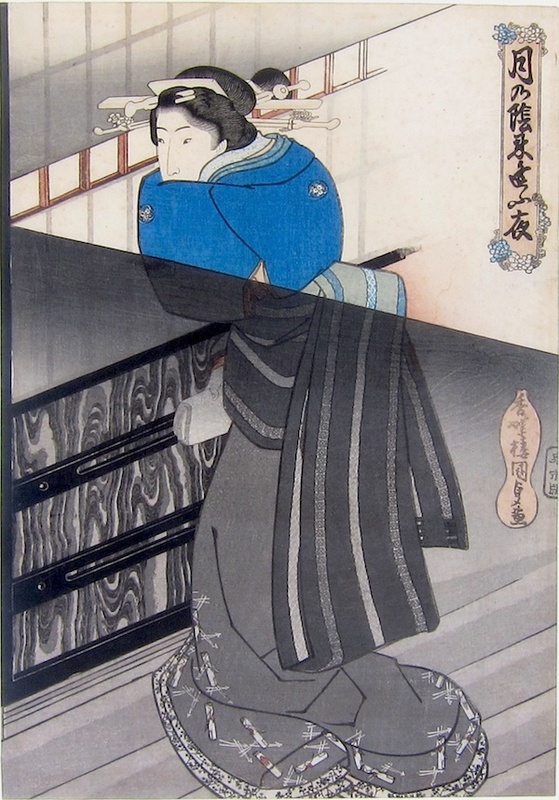 Secret Meetings by Moonlight is considered one of Kunisada’s finest Bijin series. The quality and subtlety of the printing is quite exceptional; especially so in this print. Night scenes with lamplight or moonlight for illumination were a feature of ukiyo-e and the techniques of grisaille used to show light and dark are especially evident here in this print. It is hard to disentangle the order of printing here, there is so much going on. A young woman is looking out through louvres, lit presumably by strong moonlight. She carries (as do the other women in the series) a roll of cloth indicative of a sexual liaison. The scene is clear enough; the young woman is awaiting her lover, anxiously peering into the night. The miracle of the print is the overlayed and superb shading (bokashi) of the different greys, throwing the foreground into deep shadow, highlighting the woman’s face and allowing the glazing bars to fade away into nothing as they travel across the page. The printing is of the highest standard, the design of clashing triangles against the anxious girl is daring and unusual and the drawing too is very delicate. What makes this print important however is its rarity. Horst Graebner describes this series as ‘very fine’, and lists nine designs only not including this design, on his definitive site The Utagawa Kunisada (Toyokuni III) Project. Other dealers list the series as having only six designs. It appears from our research that this print ‘missing’ from the series and is unknown in the literature. As described above, this is an outstanding Kunisada. The colour and impression are both very fine, the condition is excellent and there is nothing to mar the delicate meeting of shades in the background. The print has been trimmed at some stage.